The last weekend of June 2008 John Sindelar and I took a Dynamic Water Workshop with Ginni. On Friday June 27 we focused on surf and swell practice on the Pacific side of Cape Disappointment State Park at Benson Beach. It was definitely the largest surf I had ever paddled in. My guess: 5 - 6 foot waves. Ginni... what was it actually? Turns out I'm not in good enough shape to paddle out through the surf many times so while John was surfing in and paddling back out I stayed out beyond the surf in the swell with Ginni and we worked on paddling skills in the swell. It was a nice 3 - 4 foot swell, which was perfect for me to practice edging, turning, paddling backwards, etc. When I did surf in, I felt pretty good. I managed to paddle backwards hard several times to allow waves to pass under my boat that I didn't want to surf. I surfed some smaller waves and had lots of fun. And I was thrilled that when I dumped my boat a couple times each time my roll worked! I didn't come out of my boat the entire day. The wind really kicked up in the afternoon so after lunch we went over to Waikiki Beach in search of less wind to do a little rock gardening. But it was still pretty windy there -- appr 25 kt north wind. I went out a little, but not very far. The wind for Saturday was also predicted to be strong: N 20 - 30 kt. So that evening we were all sitting in the Sea Hag bar in Ilwaco with charts spread across a table trying to figure out what kind of trip we could do on Saturday to give us good "learning" situations but still be survivable. That was the trip planning part of the class. We studied the charts, checked the tide and weather predictions, detailed the hazards, and compared what we wanted to work on with what was doable. We decided that we'd do a journey, paddling from Ilwaco across the mouth of the Columbia River to Astoria. During the time we'd be paddling there would be a fair bit of current, but the wind from the NW would way more than overcome that. So the plan was we'd be surfing wind waves to Oregon. Way fun and great learning. As a backup we would leave a car in Warrenton at the Skipanon Marina in case we didn't want to paddle across the mouth of Youngs Bay all the way to Astoria. So Saturday morning rolls around, we do a car shuttle to leave a car in Astoria and Warrenton and drive back to Ilwaco. During the drive we notice that it's not windy at all yet. Fine so far. 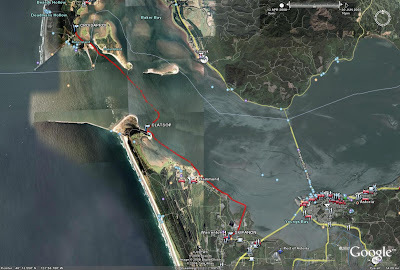 Then we launch our kayaks at the boat launch in Cape Disappointment State Park (near downtown Ilwaco) and set out toward Oregon. Still no wind. That's ok. We got to the south end of Sand Island and started to feel the beginning of the ebb. Still no wind. We were seeing all kinds of birds by now. Lots of pelicans, gulls, terns. Ginni gave us much detailed information on the terns. Our plan was to have lunch at the marina in Hammond. We headed toward Buoy 21 to get there. We encountered more ebb current and still no wind at our backs. And the sun is baking down on us as we paddle against the current. For a couple hours. During this segment of our fun filled journey I was consistently falling behind. I hate to hold up a group. I was not happy. It was very difficult for me to maintain the paddling pace to keep up with the group. So it became clear that the key thing I need to work on now to be a better paddler is just to get in better shape. Ginni was very helpful with tips on forward stroke and we paddled in line so I could draft off the others. We got to Buoy 21 and the beach on Clatsop Spit in Fort Stevens State Park looked very close. We decided to have lunch there instead of Hammond. We took a few photos and were off. We made it across the Columbia and stopped on the beach at the NE tip of Clatsop Spit (nearest spot to Buoy 21) for lunch. As we got to the beach there were plenty of people in swimsuits enjoying the hot Saturday afternoon. John and I peeled the top of drysuits off our bodies to cool off a bit. Lunch was great. But the wind died down after about an hour and the rest of the trip was just paddling upstream. We stayed near the shore to be in minimal current and found a few eddies as well. I was getting pretty tired so we ended the trip at the Skipanon Marina. We did a bit of car shuttle to get the boats back to Ilwaco, discussed the day, and I headed home. As I was driving across the bridge to Astoria I noticed a brisk west wind had developed. Though I was pretty tired, it was a good paddle trip for me -- I'd never crossed the mouth of the Columbia via kayak before! Definitely an achievement. We've been doing a fair bit of kayaking but haven't been exercising our legs much this spring, so we want to get out and do some hiking to help with that. We wanted to find out what kind of shape we were in for hiking. And we wanted to do a hike that would remind our legs what it was like to go uphill. So we decided to hike up the climbers trail from Timberline Lodge and just hike up the Palmer Snowfield until we got tired. So on a beautiful Saturday in June we did just that. Our plan was to start early enough in the morning so that the snow was very firm, but late enough so it would be softer for the hike downhill. We left Timberline Lodge at 7:30 and started hiking up the climbers trail. The snow was perfect. Nice and firm, but not icy. It was sunny, cool, but not cold. We hiked to the top of the Magic Mile and stopped for a break. We continued on and had a couple more breaks along the Palmer. Ended up stopping near the top of the Palmer. Kristin had some leg problems and I had a very sore right ankle and was starting to get blisters on the insteps of both of my feet. Just where I usually get blisters. Fine, this was intended to be an initial hike to figure out what we need to work on. So I need to figure out what's up with that ankle and remember to put moleskin on at the beginning of the hikes. We both had energy to keep going, which is encouraging. We enjoyed talking with the people who had climbed the mountain earlier in the day and were hiking down. It sounded like a great day to climb. Cool and clear and not windy at night. Snow firm at dawn for summiting. Great views at the summit. And it was entertaining to see how differently people were feeling. Some were perky and energetic and clearly were still having fun. Others... well, it looked like a death march for them. You could so easily feel the differences in their energies. Both the perky people and the exhausted ones inspired us to get into better hiking shape. So we want to do this hike more times this summer. It's both a great training hike and has beautiful views. And since we'd like to climb Hood again sometime, this hike gives us a clear view of how close we are to being in good enough shape to do it. Once we get into better shape, we want to take the Bibler up and camp somewhere above the top of the Palmer. Carrying a backpacking pack up to say Illumination Saddle would help us get into better shape! The hike down was easy. The snow had indeed softened making it easy on the joints going downhill. Got back to the car and headed home. Notes for future such trips. Need gaitors, better sunglasses. On a beautiful Eastern Washington sunny Sunday a group of OOPS paddlers kayaked part of the Hanford Reach of the Columbia River. This was a scheduled OOPS trip led by Pat Daly and co-led by Tim Mattson and Don Beale. The rest of us paddlers were: Dave Beckett, Frank Blangeard, Jay Buckingham, Ed Kraft and Greg (didn't catch his last name). I'd heard about the Hanford Reach of the Columbia for years. The last free-flowing non-tidal stretch of the Columbia in this country. Pretty much undeveloped due to it being a restricted area since the 1940's. Well, except for an old reactor here and there. Basically a wildlife refuge now. I've wanted to visit there for a long time. So when I saw that an OOPS trip was going there I was really excited. And I was thrilled when I heard that it was being led by Pat Daly, a guide who really knows the paddling in that area. The plan was to launch near Vernita Bridge (where Washington Highway 24 crosses the Columbia about 30 miles north of Richland). We would then paddle about 21 miles of the Hanford Reach and take out at the White Bluffs boat ramp. We met at the beach on the north side of the river just west of Vernita Bridge, got boats and gear situated, then did the car shuttle to the take-out. We got on the water about 11am. The water was pretty high (not surprisingly), running at appr 200,000 cfs. So once we got paddling we were moving -- soon about 6 - 7 kt. Though there was alot of water, it looked pretty clean to me. Often a few upwellings here and there. And some nice crisp eddylines. With the current it was pretty easy paddling watching the scenery breeze by. I borrowed a Greenland paddle from Don. I'd used one for the first time at OOPTIKS and really enjoyed it. Now I wanted to know how it would feel to use one on an all-day trip. Short story: I loved it. After about 4.5 miles we got to Reactor B, the first of the large-scale plutonium production reactors. It's of course closed down now. The juxtaposition of the undeveloped desert landscape and these Cold War edifices was striking. Also striking was the wildlife. Since non-Hanford people are allowed on such a small fraction of the Hanford Reservation area, animals pretty much have it to themselves. We saw lots of deer, some otter, some large fish, and lots and lots of birds from hawks to geese to swallows. I went through the rapid four or five times. It was my first time working with strong current and rapids using a Greenland paddle. I was pretty happy with it. Bracing worked very well. Stern rudder worked well. Had a bit more trouble getting up to speed quickly. Once I managed to get across to the smooth waves and surfed for just a bit. I'm sure it wasn't very long, but it felt great. Anyway, I had a great time. I could have stayed there all day. Like Deception Pass, but with sunshine! After the rapids we continued our fast and easy trip to our lunch spot. More wildlife, more sunshine, a couple more old reactors, some dead-fish polo. We stopped for lunch at the point where the river bends to the south (see map). Yep, still sunny. After lunch we paddled pretty much south along the White Bluffs. Beautiful scenery, and very different than the Lower Columbia where I paddle so often. Kayaking in the desert, a nice change. As we got closer to our take out a S wind kicked up against us, making us work a bit for the first time that day. Since the wind slowed me down I was able to really focus on various aspects of my forward stroke using the Greenland paddle. We got the the take out, which is one end of an old ferry route, got boats and gear packed up, and we all headed for home. A really nice day on the river!